At Portland Community College we have a huge student body, a gigantic amount of Web content, and a tiny little Web team trying to manage it all. Over the years, we have built a collection of custom Web apps to help us out. These work well, but take time and massive resources to maintain. All the while, content creators continue to ask for new features found in third-party sites like Flickr and YouTube. Lately, we have been learning to let go and have other websites do the heavy lifting for us. This is where the Application Programming Interface (or API) really shines. It gives you programming access to much of the data and features provided by a Web application without building one from scratch. Using API code gives you the ability to leverage the big Web apps for managing content, while still keeping the final content displayed inline on your website. We will explore how Web APIs can be used to progressively enhance and manage the content on your institutional website. 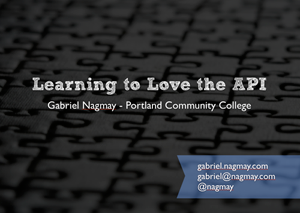 This semi-technical session is an introduction for anyone interested in leveraging APIs. It will provide a background, go over the tips to help you avoid pitfalls, and provide the code to get you started.